While it wasn’t a win, it wasn’t any less important for Casey-South Melbourne on Saturday. The Swans showed tremendous maturity and grit to fight out a draw against top-four aspirant Melbourne Uni away from home, in another sign in just how far Luke Wells’ group has come. 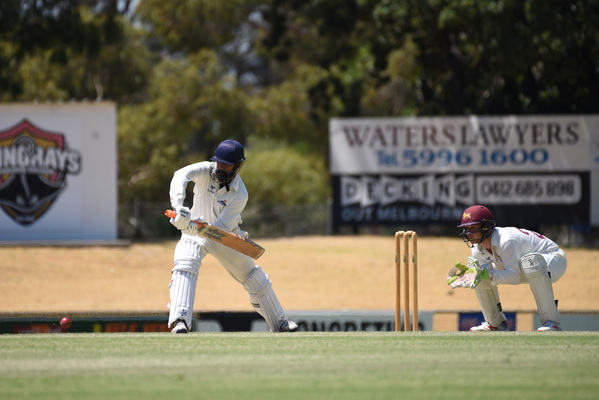 The Students set the Swans a steep 333 to chase down on day two of their clash, and despite Wells crashing four boundaries early to race to 25, Mark Stafford (3/48) broke through to start the early rot. Young opener Ryan Quirk (24) fought hard, but the losses of Ryan Eaton (14), Lachie Sperling (1) and Michael Wallace (9), and then eventually Quirk, saw the Swans in deep trouble at 5/90. With the Students up and about, Jordan Wyatt got himself to 31 off 55 balls before he was bowled courtesy of Michael Clements (1/8), but from there, the Swans’ mindset shifted, the determination to not just give away the match kicked in – it’s been a great hallmark of their season and one of the main reasons why they sit seventh on the table. Nathan Lambden (30) and Devin Pollock slowly pushed out 62 runs between them, before James Maxwell (23) showed plenty of composure to also chew up 54 balls in over an hour to help Pollock rattle along into the final session. The knocks of Lambden and Maxwell were match defining; allowing Pollock to still play his natural game. The Students threw everything they had into snaring the final three wickets of the match, eventually prizing out Maxwell, but Pollock kept going, lifting another gear to register an incredible century, his second at first XI level in a season that has seen him play some really important hands. Pollock’s stellar knock – coming off 184 balls – featured 12 boundaries and two sixes, was instrumental in the context of the game. With only overs to play, Pollock was eventually bowled for 104 by seamer Steven Reid (1/58), giving Josh Dowling and Jackson Fry a tricky six overs to bat out. Pressure mounted, but the pair blocked it out with the fielders eagerly waiting for a mistake, chewing up 57 balls between them to secure a draw, finishing on 9/274 off their 96 overs. The Swans return home on Saturday for a two-day match against Geelong at Casey Fields. Dandenong, meanwhile, got their season back on track with a vitally important win in the context of their season against Fitzroy Doncaster at Shepley Oval. The Panthers – needing a win to break back into the top eight – resumed play at 4/102 in toe of the Lions’ 159, and it didn’t take long for star quick Trent Lawford to break through, finding the edge of Cam Forsyth to give the visitors a nice start. Josh Shaw and keeper Jacques Augustin also fell not long after to see the home side sitting uncomfortably at 7/145, bringing all-rounder James Nanopoulos and spinner Akshat Buch together. Buch, who has proven countless times that he’s got some tricks with the bat, struck an outstanding 41 off 97 balls, combining for the match winning 56 run stand with all-rounder James Nanopoulos, who continued his golden season with a 126-ball 68, a knock featuring 10 fours and a six. Nanopoulos has been in outstanding form all season, and is now up to 387 runs at 55.3 along with his 20 wickets at 19.6, providing the perfect middle-order weapon for Tom Donnell’s side. After securing first-innings points, the Panthers were eventually rolled for 231, with Lawford finishing with 4/65 and emerging quick Sam Elliott showing tremendous signs with 5/58 from his 13 overs. The Lions had a late dip with the bat, finishing on 2/50 before stumps was called, handing the Panthers a crucial six points to surge them into the top-eight. Riding some much needed momentum, the Panthers will be looking to climb further up the table when they travel to Greenvale on Saturday. A stunning bowling performance from Sorrento saw Langwarrin almost fall to a shock outright loss at David Macfarlane Reserve. Chasing 255 for victory, the Kangaroos were rolled for just 64, with Adeel Hussain on fire with 8/33 from his 14 overs. Following on, the Kangaroos were 5/34 before recovering to finish 5/62, with Hussain crossing 10 wickets with the match with 4/30 from a further 16 overs. Pearcedale, meanwhile, seem destined to lose their spot in the top grade after falling to an outright loss to Baxter. The Panthers lost on the first innings on day one, and were rolled for 152 on day two, before the visitors got the runs with six wickets to spare to secure the maximum 20 points. In other matches, Flinders (4/169) scored a stunning win over Mornington (166) at Cairns Reserve, while Peninsula OB (8/267) defeated Mt Eliza. The MPCA also geared up for its upcoming Country Week campaign with a win in a practice match against Frankston Peninsula on Sunday at AH Butler Oval. Endeavour Hills face a tough ask against Mt Waverley after a tough day in the field. The Mounties racked up 6/251 off their 80 overs, with the Eagles unable to break several strong partnerships throughout the day. And Noble Park and Box Hill are engaged in a tight battle at Pat Wright Senior Oval after a fascinating opening day. The Hawks won the toss, and made 148 off 57 overs, with Nilochana Perera (6/29) in incredible form, before the Parkers scratched their way to 3/42 at stumps off 15 overs.